After several years of other focuses in Film and Television, Renny Roker creator and founder of JAGBMX has decided to restart the JAGBMX organization back to its formal glory. 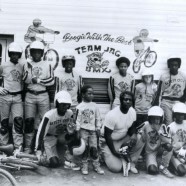 Years ago, the JAGBMX racing team won several national all championships in BMX and greatly impacted the lives of countless young men worldwide. The new JAGBMX will not only have the same impact but a brand new facility for the JAGBMX organization. This is great opportunity to help our kids and service men and women. Where is track located? Can’t wait to bring my kids out to ride. Hope you rent our vbuilding on Hoagland Blvd. Good Luck in your future ventures! Good job on the web site, now we get started and the World will Welcome us! Our mission is to improve character and personal athleticism of kids while enhancing their academic success and expose kids who were traditionally under served students to national and international BMX bicycle competition and events.